Heat olive oil in a 3 quart cast iron Dutch oven or stew pot. Add meat, if using. Remove meat when cooked and let cool. Add 2 quarts water and all vegetables and tofu, if using. (You can also use both tofu and meat.) Add canned tomatoes if using. Bring to a boil and cover. 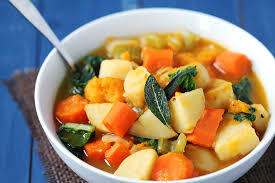 Reduce heat to a simmer and cook for about ½ hour, until all vegetables are tender. Add chopped meat and cook for 15 minutes longer so flavors can blend. Season with salt and pepper and enjoy.